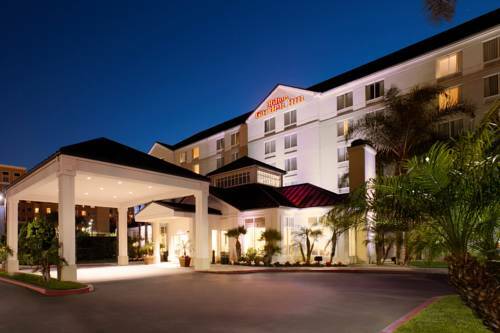 Just beyond the hustle and bustle of busy downtown is the quiet comfort of the Hilton Garden Inn Anaheim/Garden Grove. Within proximity of many attractions and prominent corporations the newly renovated Hilton Garden Inn Anaheim/Garden Grove hotel in California is the ideal location for business and leisure travelers alike. Whether the purpose of your visit is an exciting trip to the Disneyland Resort or to attend a meeting or convention at the Anaheim Convention Center the Hilton Garden Inn has everything right where you need it. Our newly refreshed focus-service hotel boasts warm yet modern surroundings and smart amenities. The Garden Grille and Bar restaurant serves a delicious hearty breakfast relaxing dinners and drinks. Order room service for a change of pace. A variety of Anaheim dining options are within close walking distance of the hotel. Other amenities include our complimentary fitness center business center complimentary WiFi throughout the hotel outdoor swimming pool heated whirlpool and complimentary self-parking. The 24-hour Pavilion Pantry allows our guests the convenience of late-night beverages and snacks as well as toiletries that may have been forgotten. Our guests always enjoy hospitable Hilton Garden Inn Anaheim/Garden Grove staff members who are dedicated to providing exceptional service and strive to ensure that your experience exceeds your expectations. The Great American Grill has been recently renovated and now offers breakfast and dinner. Join us daily for freshly prepared favorites in a casual atmosphere. Relax at the bar after a busy day of business meetings or sight-seeing and enjoy a quiet drink.